For other uses, see Secret society (disambiguation). "Secret Society Buildings at Yale College", by Alice Donlevy ca. 1880. Pictured are: Psi Upsilon (Beta Chapter), 120 High Street. Left center: Skull & Bones (Russell Trust Association), 64 High Street. Right center: Delta Kappa Epsilon (Phi Chapter), east side of York Street, south of Elm Street. Bottom: Scroll and Key (Kingsley Trust Association), 490 College Street. A secret society is a club or an organization whose activities, events, inner functioning, or membership are concealed from non-members. The society may or may not attempt to conceal its existence. The term usually excludes covert groups, such as intelligence agencies or guerrilla insurgencies, that hide their activities and memberships but maintain a public presence. The exact qualifications for labeling a group as a secret society are disputed, but definitions generally rely on the degree to which the organization insists on secrecy, and might involve the retention and transmission of secret knowledge, the denial about membership or knowledge of the group, the creation of personal bonds between members of the organization, and the use of secret rites or rituals which solidify members of the group. Anthropologically and historically, secret societies have been deeply interlinked with the concept of the Männerbund, the all-male "warrior-band" or "warrior-society" of pre-modern cultures (see H. Schurtz, Alterklassen und Männerbünde, Berlin, 1902; A. Van Gennep, The Rites of Passage, Chicago, 1960). A purported "family tree of secret societies" has been proposed, although it may not be comprehensive. shows a strong inclination to favor its members. It has "carefully graded and progressed teachings". Teachings are "available only to selected individuals". Teachings lead to "hidden (and 'unique') truths". Truths bring "personal benefits beyond the reach and even the understanding of the uninitiated." Barrett goes on to say that "a further characteristic common to most of them is the practice of rituals which non-members are not permitted to observe, or even to know the existence of." Barrett's definition would rule out many organizations called secret societies; graded teaching is usually not part of the American college fraternities, the Carbonari, or the 19th century Know Nothings. Because some secret societies have political aims, they are illegal in several countries. Italy (Constitution of Italy, Section 2, Articles 13–28) and Poland, for example, ban secret political parties and political organizations in their constitutions. Many student societies established on university campuses in the United States have been considered secret societies. Perhaps one of the most famous secret collegiate societies is Skull and Bones at Yale University. 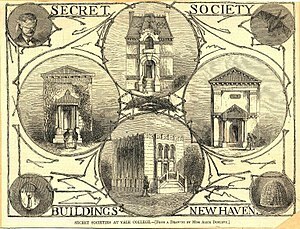 The influence of undergraduate secret societies at colleges such as Harvard College, Cornell University, Dartmouth College, the University of Chicago, the University of Virginia, Georgetown University, New York University, and Wellesley College has been publicly acknowledged, if anonymously and circumspectly, since the 19th century. British Universities, too, have a long history of secret societies or quasi-secret societies, such as The Pitt Club at Cambridge University, Bullingdon Club at Oxford University, and the 16' Club at St David's College. Another British secret society is the Cambridge Apostles, founded as an essay and debating society in 1820. In France, Vandermonde is the secret society of the Conservatoire National des Arts et Métiers. Notable examples in Canada include Episkopon at the University of Toronto's Trinity College, and the Society of Thoth at the University of British Columbia. Secret societies are disallowed in a few colleges. The Virginia Military Institute has rules that no cadet may join a secret society, and secret societies have been banned at Oberlin College from 1847 to the present, and at Princeton University since the beginning of the 20th century. Confraternities in Nigeria are secret-society like student groups within higher education. The exact death toll of confraternity activities is unclear. One estimate in 2002 was that 250 people had been killed in campus cult-related murders in the previous decade, while the Exam Ethics Project lobby group estimated that 115 students and teachers had been killed between 1993 and 2003. While their existence had been speculated for years, internet-based secret societies first became known to the public in 2012 when the secret society known as Cicada 3301 began recruiting from the public via internet-based puzzles. The goals of the society remain unknown, but it is believed that they are involved in cryptography and cryptocurrency. The only secret society abolished and then legalized is that of the philomaths; it is now a legitimate academic association founded on a strict selection of its members. Further, by abstaining from membership in secret societies. We will on no account tolerate our ministers and members joining or holding fellowship with secret societies, as, in the judgment of The Allegheny Wesleyan Methodist Connection (Original Allegheny Conference), it is inconsistent with our duties to God to hold such relations. “Jesus answered him, I spake openly to the world; I ever taught in the synagogue, and in the temple, whither the Jews always resort; and in secret have I said nothing” (John 18:20). “Wherefore if they shall say unto you, Behold, he is in the desert; go not forth: behold, he is in the secret chambers; believe it not” (Matt. 24:26). “But above all things, my brethren, swear not, neither by heaven, neither by the earth, neither by any other oath: but let your yea be yea; and your nay, nay; lest ye fall into condemnation” (Jas. 5:12). ^ Stevens (1899), p. vii. ^ "The Constitution of the Republic of Poland". 2 April 1997. Article 13: Political parties and other organizations whose programs are based upon totalitarian methods and the modes of activity of nazism, fascism and communism, as well as those whose programs or activities sanction racial or national hatred, the application of violence for the purpose of obtaining power or to influence the State policy, or provide for the secrecy of their own structure or membership, shall be prohibited. ^ [dead link] "Skull And Bones". The Secret Society Manual. thesecretbookgarden.com. Retrieved 11 May 2012. ^ "To The Members of the University of Chicago". The University of Chicago Magazine. 5 (9): 298. July 1913. ^ Megan Findling (3 November 2011). "Edgar Allan Poe in Greenwich Village" (article). Researching Greenwich Village History. greenwichvillagehistory.wordpress.com. Retrieved 11 May 2012. ^ "Secret Societies. The Harvard Crimson". ^ "Student Government at Wellesley and How It Makes for Loyalty among the College Girls and Faculty". New York Times. 12 February 1912. ^ Bowers, Mary (17 November 2006). "Pitt Club under pressure from Council" (PDF). Varsity. p. 5. Retrieved 20 August 2009. ^ a b Gray, Kirsty (11 February 2011). "Oxford's Bully-ingdon Club faces more scandal". Varsity. Retrieved 25 June 2011. ^ "Naissance de " Alexandre-Théophile Vandermonde ", mathématicien français – Espace " Sciences du Numérique " Alan Turing (LJAD – CNRS/UNS)". www.espace-turing.fr. Retrieved 20 August 2017. ^ "Regulations for the Virginia Military Institute, Part II, Revised 5 December 2008, 12–16(b)". vmi.edu. ^ Student Regulations, Policies, and Procedures, Oberlin College 2011–2012 (PDF). new.oberlin.edu. 2011. p. 34. D. Secret Societies: "No secret society is allowed at Oberlin, and no other societies or self-perpetuating organizations are allowed among students, except by permission of the faculty. This is to be understood to include social and rooming-house clubs." ^ Bell, Chris (25 November 2013). "The internet mystery that has the world baffled". Daily Telegraph. Retrieved 23 July 2014. ^ Ernst, Douglas (26 November 2013). "Secret society seeks world's brightest: Recruits navigate 'darknet' filled with terrorism, drugs". The Washington Times. Retrieved 23 July 2014. ^ NPR staff (5 January 2014). "The Internet's Cicada: A Mystery without an Answer". All Things Considered, National Public Radio. Retrieved 13 May 2014. ^ Scott, Sam (16 December 2013). "Cicada 3301: The most elaborate and mysterious puzzle of the internet age". Metro. Retrieved 16 December 2013. ^ Arthur Morius Francis. Secret Societies. Vol. 3: The Collegiate Secret Societies of America. 2015 (file pdf). ^ a b The Discipline of the Allegheny Wesleyan Methodist Connection (Original Allegheny Conference). Salem: Allegheny Wesleyan Methodist Connection. 2014. p. 20-21. Heckethorn, Charles William (1886). The Secret Societies of All Ages and Countries, Embracing the Mysteries of Ancient India, China, Japan, Egypt, Mexico, Peru, Greece, and Scandinavia, the Cabbalists, Early Christians, Heretics, Assassins, Thugs, Templars, the Vehm and Inquisition, Mystics, Rosicrucians, Illuminati, Freemasons, Skopzi, Camorristi, Carbonari, Nihilists, and Other Sects (2nd ed.). Forgotten Books. ISBN 978-1-4400-8999-2. Whalen, William Joseph (1966). Handbook of Secret Organizations. Milwaukee: Bruce Pub. Co. LCCN 66026658. Harwood, W. S. "Secret Societies in America," The North American Review, Vol. 164, No. 486, May, 1897. Hodapp, Christopher; Von Kannon, Alice (2008). Conspiracy Theories and Secret Societies For Dummies. Wiley. ISBN 0-470-18408-6. Jacob, Frank (2012). Geheimgesellschaften: Kulturhistorische Sozialstudien: Secret Societies: Comparative Studies in Culture, Society and History. Würzburg: Königshausen & Neumann. ISBN 978-3826049088. Kloosterman, Jaap (2013). Secret Societies. Leibniz Institute of European History (IEG). Stevens, Albert Clark (1899). The Cyclopædia of Fraternities. New York: Hamilton Printing & Publishing Company. Stephen Klimczuk, Gerald Warner (2009). Secret Places, Hidden Sanctuaries: Uncovering Mysterious Sights, Symbols, and Societies, New York: Sterling Publishing Company. Look up secret society in Wiktionary, the free dictionary. Wikimedia Commons has media related to Secret societies. Stevens, The cyclopædia of fraternities (2nd ed.). A dated review of the subject.